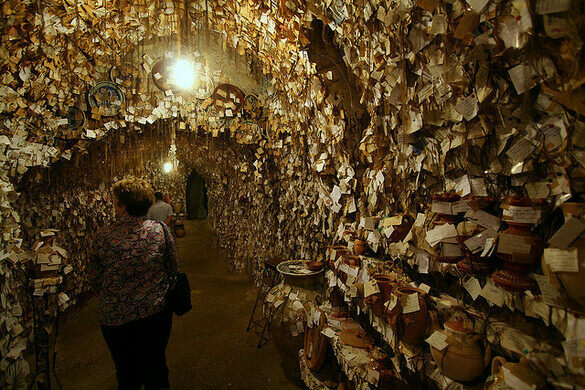 Locks of women's hair adorn the walls of a cave/house/pottery center with a surprisingly touching origin. Avanos, a small town in the Cappodocian area of Turkey, has a history of ceramics and pottery dating back thousands of years. However, starting mere decades ago, a new site is generating interest. A pottery center/guest house has created the Hair Museum. 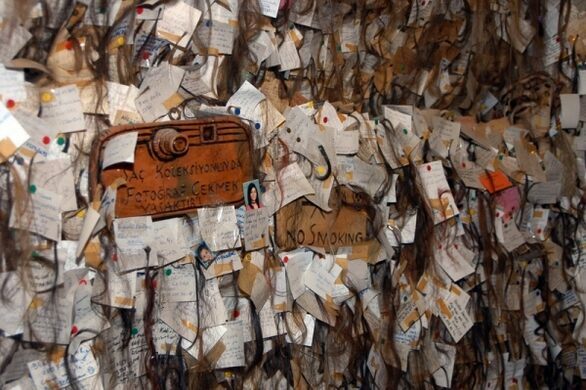 Calling it a museum may be a bit of a stretch as its “displays” are thousands of locks of hair, all from female visitors. The story goes that the local potter was bidding farewell to a dear friend of his when he asked for something to remember her by. She cut off a piece of her hair to leave as a reminder. He put it up in his shop, and told the story to the visitors and tourists who passed through. Not to be outdone, other women who enjoyed the story left a piece of their hair as well. The museum started in 1979 when a selection was put up for display. It now holds an estimated 16,000 samples by the museum’s own count and is included in the Guinness Book of World Records. There’s a secondary reason to leave some hair as well – once or twice a year, winning locks of hair are chosen and the previous owners of the tresses get a message inviting them back for a stay in the connected guest house, and workshops with the master potter. While the pottery and guest house remain active, the museum fills up a section of the shop where the earthen wares are stored. Visitors wander down the cave-like room with hair attached to every available surface. Pencils, paper, pins and scissors are offered to those wanting to add their own piece to the collection.